During my Olim Adventurers project, I naturally had to paint a miniature for myself. Human Wizard. I love the aesthetic of Privateer Press' steampunk elves, such a great mix of fantasy and sci-fi. So, I present to you Elgan! I painted with washes as a shortcut to complete him in a reasonable amount of time, but still added some of my special touches. 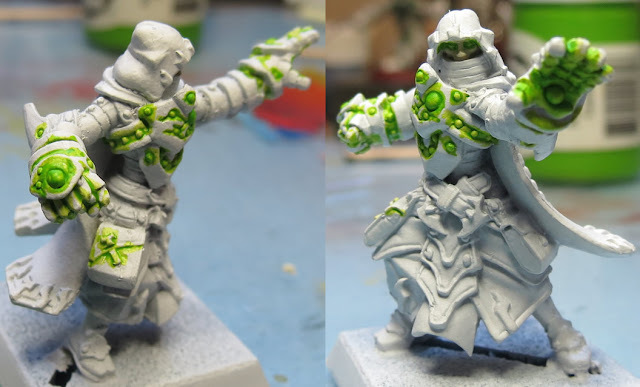 Read on, and I'll detail some specifics of how I approached his OSL, (Object Source Lighting) metallics and my gels. Started out with a white base coat. 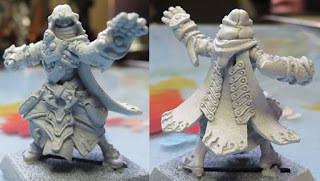 I don't often do this because I love the dark contrasts of a black primer, but a white primer lets you use shortcuts for tabletop quality miniatures the best. I watered down some bright green and painted it over the areas I wanted to be glowing. By painting the bright paint over white, it gives me the brightest colour I could ask for. Next, I've used a dark brown wash over the bulk of the miniature and a chestnut wash over some of the wrappings and the cloth down his front. Not pictured: I actually re-washed the the chestnut areas with a red wash because I wanted them to stand out more. I've started with a dark brown paint, followed by dark tin / brown metallic. As I've painted the metal, I ended up painting over some of the glowing outsides, that's OK. In the case of his open hand, I simply didn't paint the metal over the green areas. Again, this keeps the green strongest there. So, that first step up above really did the bulk of the work. If you wanted to, you could stop there. OPTIONAL: I've highlighted cloth in the photo below. Beige on the bulk of him, then a light-red on the wrappings. I've simply super-glued on some sandbox desert-like sand. As a final step, I've highlights edges with a brighter bronze like metallic. I watered the green paint down again and washed it into the crevices and details around the green spots creating my glow. 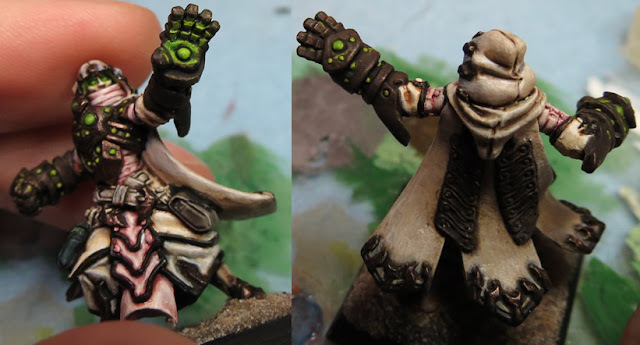 OPTIONAL: Just a little more highlighting on the beige robes to whiten some of the highest edges. I've used some of my sculpting effects gel and created a twisting funnel from his spellbook to his closed fist as well as some sparks that are shooting out of his gauntlet. Since I don't paint it thickly, you can see light shine through some. Washed the gel with the thinned green paint. Highlighted the edges with white, like pure energy spikes shooting off. I've also added some white to crevices where the energy would be brightest. I've added a little gold to some of the metals as a stronger shine. Just pointing out that on the open hand, I've used gel to create energy sparks here too. 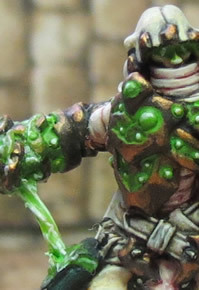 You can see in better detail how I've washed bright green in the detail crevices. 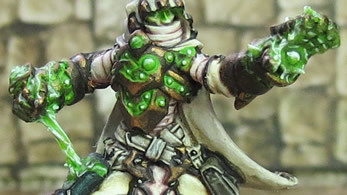 I've highlighted with white, just on the light sources and his eyes. What I really like about this look is it's as if he's channeling magic from his book and out his raised hand.